This article describes the architecture and operation of the Nuage Networks SDN product line and its integration with Avi Vantage Platform. The intent is to provide insights into the underlying interoperation and capabilities from a high level for both products. 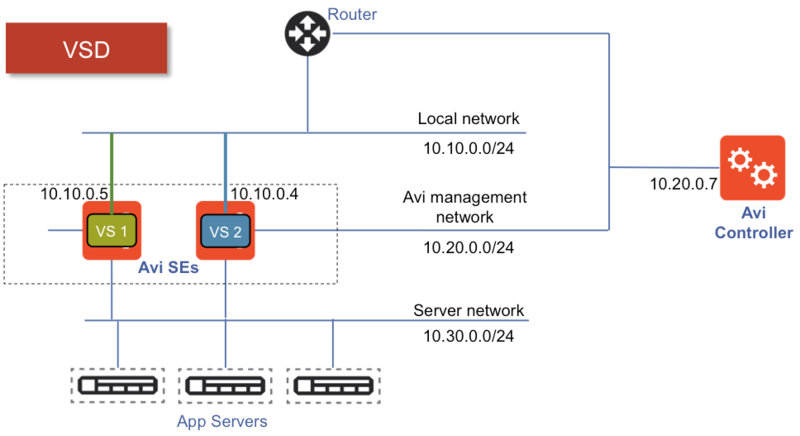 Note: IPv6 is not supported for Nuage Networks integration as yet in Avi Vantage. The Nuage Networks Virtualized Services Platform is composed of three major layers. Each layer has its own form factor. Nuage Networks Virtualized Services Platform (VSP) is a comprehensive solution that makes the network as readily consumable as compute resources across the data center, enterprise WAN and public cloud providers. It does this by providing the missing link to ensure rapid and efficient delivery of highly customizable application services, in and across multi-tenanted data centers. 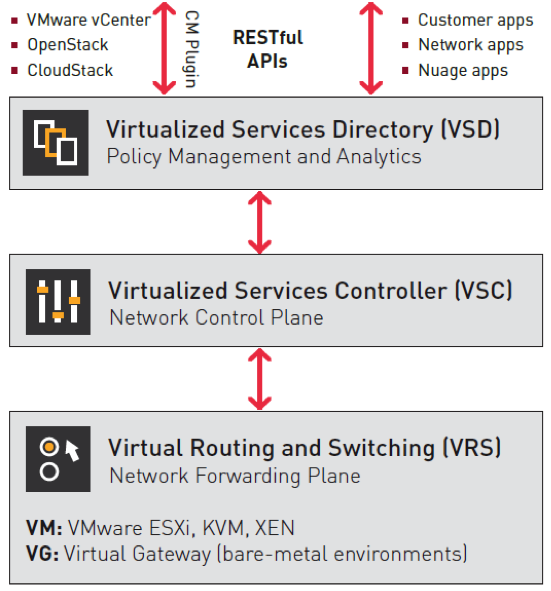 The Nuage Networks Virtualized Services Directory (VSD) is a policy & business logic engine that simplifies the definition of network services in an application friendly context. It provides enterprise administrators the freedom to outline the networking requirements of their cloud applications in familiar IT constructs, and establishes policies that ensure the proper scope, security and integrity of application consumption in a manner consistent with enterprise guidelines. 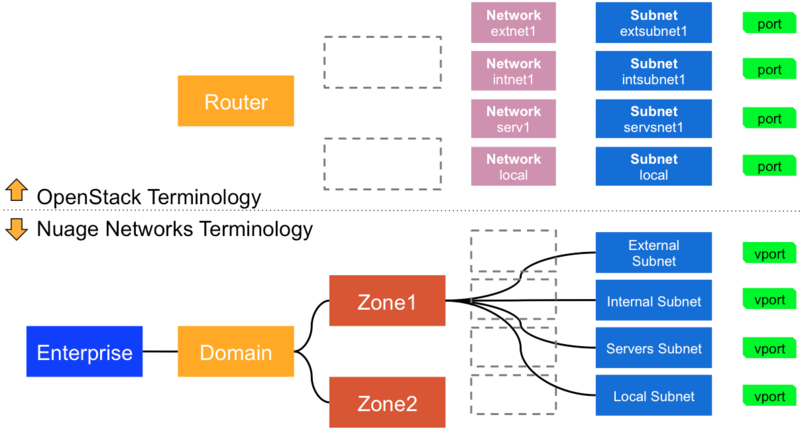 The Virtual Routing and Switching (VRS) component is an enhanced Open vSwitch (OVS) implementation that constitutes the network forwarding plane. It encapsulates and de-encapsulates user traffic, enforcing L2-L4 traffic policies as defined by the VSD. The VRS tracks VM creation, migration and deletion events in order to dynamically adjust network connectivity. The VRS supports multiple hypervisors in virtualized server environments. It can operate as a gateway for bare-metal servers or service appliances. Nuage Networks VSC is a software-defined networking (SDN) solution that virtualizes any DC network infrastructure and automatically establishes connectivity between compute resources upon their creation. Leveraging programmable business logic and a powerful policy engine, VSC provides an open and highly responsive solution that scales to meet the stringent needs of massive multi- tenant DCs. VSC is a software solution that can be deployed over existing datacenter network fabrics and to public cloud providers. 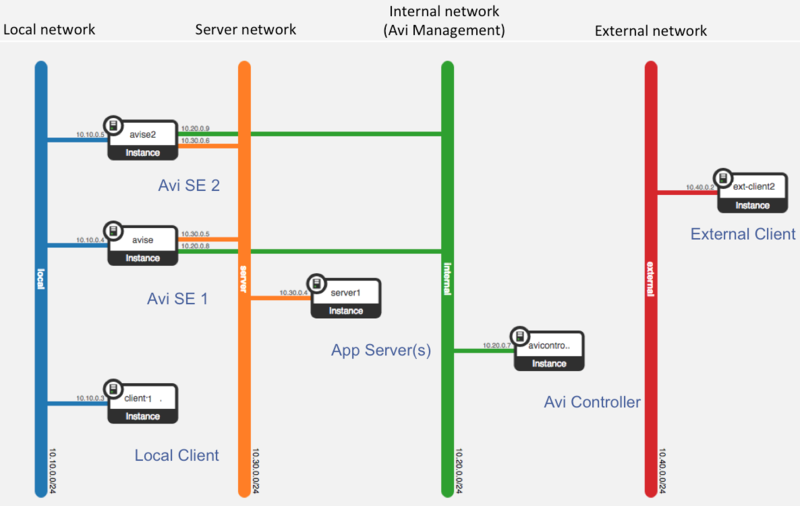 The Avi Vantage Platform takes a software-defined approach to delivering application services beyond load balancing. Avi Vantage enables a distributed data plane with central management. 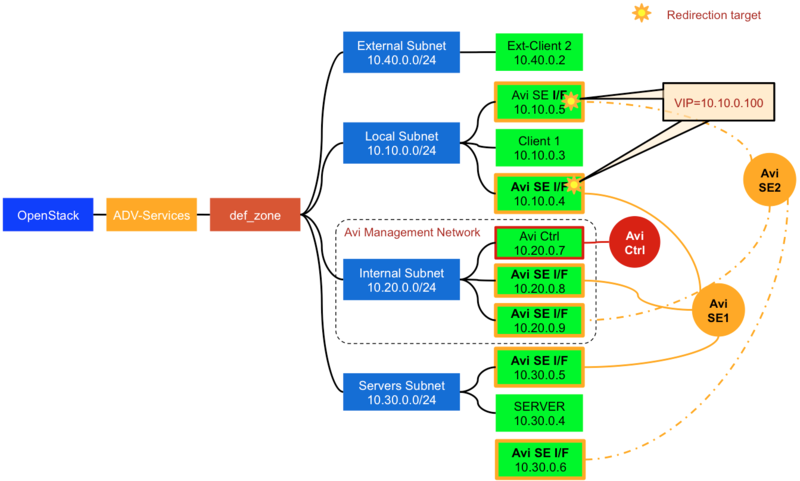 This is how the network topology would look in Horizon UI once the same is instantiated from Avi Vantage. Configure Nuage VSD credentials on Avi Controller. 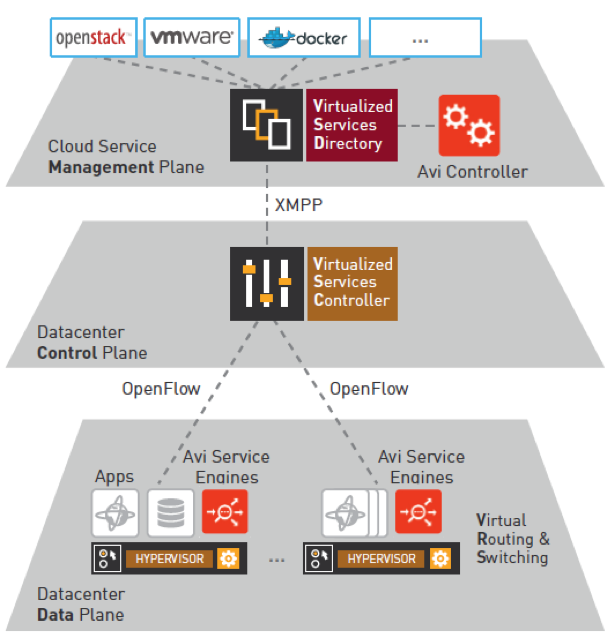 Read more details in Installing Avi Vantage for OpenStack. Note: VSD credentials are required to directly call into VSD for programming the FIP-to-VIP binding/unbinding. The Avi Controller uses the Avi SEs’ OpenStack UUIDs to automatically look up vPort and domain information using VSD API calls. The Avi Controller automatically creates, configures, and manages one redirection target (a group/collection of vPorts belonging to the same domain) per VIP in VSD through VSD APIs (virtual IP, allowed vPorts). The operator is not expected to manage these redirection targets. Client and VIP/Avi SE on the same subnet. Avi SE responds to ARP for 10.10.0.100 (VIP). Avi SE load balances the traffic on the server network. 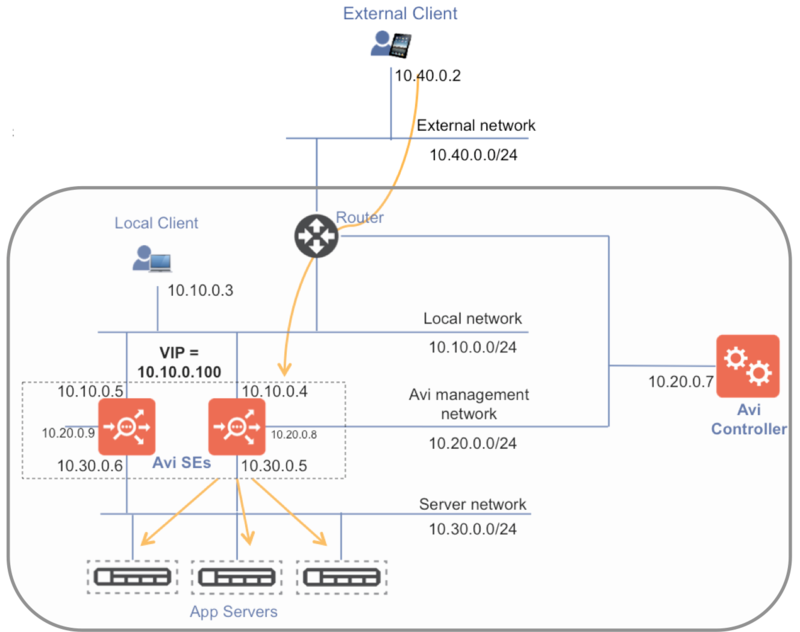 Client and VIP/Avi SE on different subnets. Primary Avi SE responds to ARP for 10.10.0.100 (VIP). Primary SE load balances the client flows across the scaled-out SEs. Avi SEs load balance the traffic on the server network. When an SE VM is created, each interface gets an IP address allocated by OpenStack. 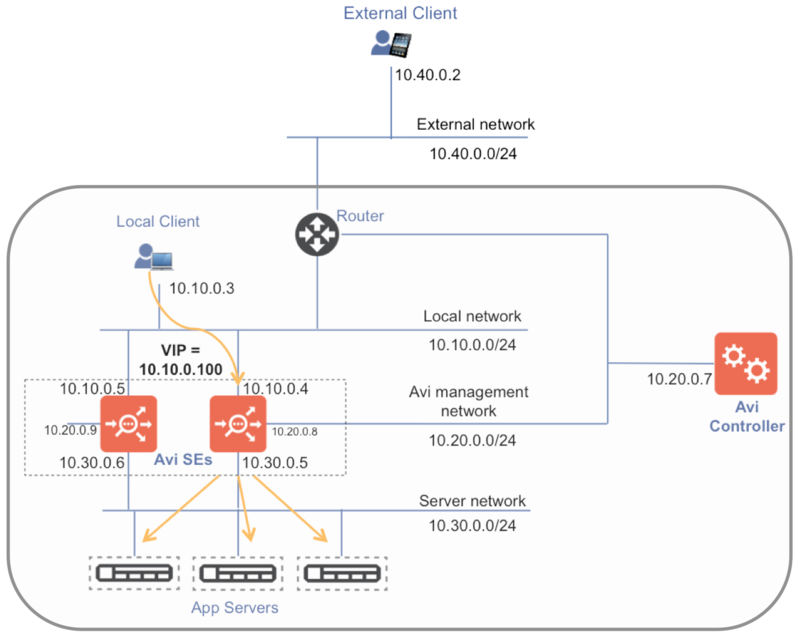 When a virtual service (VS) with a VIP (in local network/subnet 10.10.0.0/24) is created, Avi adds the VIP as the secondary IP address to the interface on the SE. The Nuage router does not learn unknown mappings. Nuage allocates the interface IPs. Hence, they know the IP/MAC/Port binding. The VIP IP address is configured via LBaaS. Hence, they do not know the MAC/port binding for this IP address. When a virtual service is created, the Avi Controller calls Nuage’s allowed-address-pair/redirection target to create MAC/port binding for the VIP. 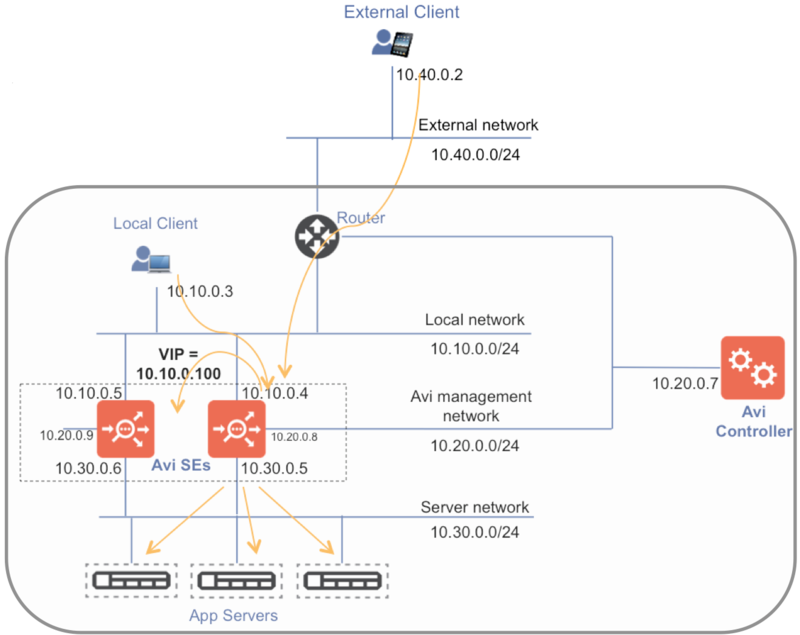 Avi notifies Nuage about the VIP (secondary IP) and its MAC/port binding. This also enables MAC/ARP learning for the VIP. In case of scale out, Avi programs the allowed-address-pair/redirection-target for relevant ports of all SEs. At any time, only one SE (primary) responds to ARP requests.